things come cheap, but not freedom. Why? Is it JUST concept? People love power… the rule over others. Sometimes that ‘power’ does something to a person, (“absolute power, corrupts absolutely”) the façade falls away, the real agenda appears, formerly called “conspiracy theorists” say “I told you so”, and the real person appears. The one, who sold multitudes with smooth talk, becomes something else. Not everyone is motivated to lead …. Most are supporters and followers, and are happy to be such. This is not bad… People are people. People innately want to be free… but not all want the responsibility of freedom. Freedom demands much… and sometimes is too much for the faint of heart. Like Israel of old…. they came to Egypt and enjoyed the favor of the Pharaoh, since Joseph had been such a blessing to Egypt (Genesis 40-45). Then something happened…. Joseph and his generation died and another ruler came to power… “he didn’t know Joseph” (Exodus 1). He feared Israel because they were many. Freedom was lost for Israel almost over-night and they were made slaves. Four hundred thirty years later they leave Egypt… a free nation. Yet when hardship and responsibility came, they complained and murmured and cried out that they wanted to go back into slavery. Being told what to do, when to do it, fed when it was time, go ‘home’ to sleep… get up the next day and start over. No! Freedom isn’t easy…. nor is it cheap. Freedom is not always lost over night. Sometimes it is lost slowly… quietly. Sometimes it takes a few years, sometimes a hundred years. Those who would take freedom from others have to plan it well and carry out their plan quietly at first, because freedom is dear, and they know that people will rebel if it’s not done ‘right’. Is America loosing the freedom for which so many have and continue to give their lives? My opinion is yes… America has a few voices crying out… warning Americans… but many are not listening. There is a fear of being different, mocked, laughed at… the ‘silent majority’ remains silent. All the while something is happening… It has not been done quickly, but it is picking up speed. Things which made America strong morally, and respected… are being chipped away… How shall America stand, without the foundation on which it was established? Is America still beautiful? Yes! But, her beauty is fading. Is America loosing its freedom? You decide! Can one person make a difference? Yes. Americans must wake up, individuals must do what they can. Not thinking, “Well, I’m only one person.” Just stand… make a difference. If enough of us do…America will once again be a light on a hill… and the world will once again have the respect America so much deserves. Freedom is invaluable, as Christians as well. Paul said, “It is for freedom that Christ has set us free. Stand firm, then, and do not let yourselves be burdened again by a yoke of slavery (Galatians 5:1). Before you give up freedom… think about what it would be like to be without it. (This article was inspired by the “Last ounce of Courage” a great inspiring movie!!!). Charles Hodge Jr. who for many years wrote articles “From the banks of Onion Creek” wrote one of the most challenging articles I have read. It is not easy… it is not simple…. and it is not for the ‘not-open-to-thinking’ type person. It is for the one who is objective and willing to think about what has for many years been an on-going problem. To put it succinctly, we have a problem with differences. “One-Up-man-ship! Repulsive, divisive, destructive! The (illegible) of preachers to always be “Top Dog”…”always quick to put others down. The end of what would have been great friendships, relationships. The “know-it-all”, the “I am right and you are wrong.”… “I deny anything you affirm”… “I will win all at any price.” … the aggressive, radical, (illegible), infallible, orthodox! Pathetic! What one small circle! The mind is “closed up”. Others cannot be listened to,… others cannot be allowed to express themselves…. others cannot disagree or question. Dogmatic, contentious, abrasive, “One-upmanship”. So many wives have to live with such! So many churches have to put up with such! How pathetic! Said folks must always be right — there is no margin for ignorance or mistake. They must be the highest authority (illegible) and all subjects. Actually, they consider themselves infallible All others are suspect. They remove risk from themselves — the privilege to (illegible), to grow, to (illegible), to fail, to be wrong, to be human. “Sit down, (illegible) and listen to me. Communication is a “One Way Street”. Said folks must (always) be right. There is always a great, great need for all Christians to keep a close watch on attitudes and how we deal with others in the body of Christ. We need to come together on some basic facts. 1.) We are brethren – family, because of the work and sacrifice of Jesus Christ. 2.) This is not determined by everyone agreeing on every single thing, while agreeing on some basic core beliefs. 3.) Fellowship is something given by God as He adds those who come to Christ (born again). “Fellowship” is a noun not a verb. (Acts 2:38-47). 3.) We need to be open to studying, searching, and discussing the scriptures… and be willing to accept truth within the context. 4.) We need to encourage questions and discussions in our bible Classes…and listen to each other… even if we have differing views… which should be open for discussion and comparison with the scriptures. 5.) We need to always love each other and sometimes even just agree to disagree… but unless one denies some basic, foundational truth… consider them brethren. 6.) We need to refuse to be part and partial to ANY EFFORTS TO DIVIDE THE CHURCH. While understanding the warning of Paul to ‘mark’ or avoid those who promote division… (Romans 16:17). Extremes more often than not, lead to a misunderstanding of truth. Dad encouraged as do I, that we should strive for BALANCE in our understanding of scriptures. To focus on a cup, rather than the contents, and the principles taught is to miss the point. To focus on the act of washing feet as an “act” which must be done… is to miss the teaching that to have the heart of Jesus means having the heart of a servant on an on-going basis. How did Jesus deal with his disciples? Much differently than we deal with each other. Let’s grow…. Dad wrote this in his New Testament…. “This is a replica of Leonardo da Vinci’s painting of the Last Supper. This masterpiece took over seven years to paint. The extra ordinary story behind this masterpiece is astounding. Leonardo felt that he should use living persons as his models since this was to be such an important picture. He started with the painting of Christ. Hundreds of young men were studied to find a man who’s face portrayed innocence and beauty. After a long search he found a man whom he felt could portray Christ. The painting of Christ took six months. When he was done with Christ, it took 6 more years to paint the disciples until all were completed accept one. That one was Judas. To find someone who looked like Judas was a problem. After a long discouraging search, da Vinci heard of a man in prison in Rome who was sentenced to die for his brutal crimes. Leonardo went to Rome where the prisoner was brought before him. He saw in this man who’s face was ugly and vicious – scarred and full of hate. He knew immediately that this was the man he wanted to represent Judas, the Savior’s betrayer. This was copied by dad when he was in Calgary, Alberta while visiting a member of the church and he happened to glance through the Family Bible. People change… sometimes for the better…sometimes not. Jesus warned against this since we don’t know what is in the heart of man. Marshall Keeble once said, “I’m not a judge… I’m a fruit examiner.” It might do us better if we just examine the fruit as opposed to judging based our feelings or ‘think-so’s’ or on what someone else says. The way we judge others will come back to bite us as we will be judged the same way (Matthew 7). Fact is, we just don’t know what’s in the heart of man… but Jesus does. Paul later instructs us to be careful when dealing with Christians who fall or sin… Helping, restoring… with a spirit of gentleness demands a spiritual heart. The danger? Who knows… somewhere down the ‘time-line’ you also may fall…. Falling is not usually done over night… it happens ‘bit by bit’ and step by step in the wrong direction. Beginning in the heart (Matthew 5:27-28), which is just as bad as the ‘real thing’ only to find that ‘thoughts not taken captive for Christ’ have taken to root and produced a plant that bears bitter fruit… You may not even recognize yourself. Amazing grace, how sweet the sound that saved (saves) a wretch like ME….Praise God for His matchless grace… Amen walls!!! The church has many who are “away from home” and “hurting”. Jesus once told a parable (Luke 15) of a shepherd who had 100 sheep. One of them got lost. He asked his listeners, which of them would not leave the 99 and go and search for the one which was lost until it was found? The challenge has always been for the family of God to act like a family and care for each one. The challenge of the body of Christ has always been to feel the hurts of each member of the body and care enough to reach out and heal. One area where many have suffered and are in pain, is where Divorce has occurred. Leaders have been hurting as well, not knowing how to deal with this situation which is growing not only in America but also in the church. Evangelism has suffered because of traditional teaching on this subject and has resulted in turning away those who have been divorced and remarried (sometimes two or three or more times). Dad did his own study on this subject, and communicated with Olan Hicks (well known for his debates on this topic… www.olanhicks.com). He was in agreement with Olan on this subject… believing that those who had gone through Divorce (for non-adultery causes) and were re-married before they became Christians DID NOT HAVE TO SEPARATE, RETURN TO FORMER HUSBAND OR WIFE, OR LIVE UNMARRIED FOR THE REST OF THEIR LIVES, in order to become a Christian. He said that there is no example of this being a requirement in the writings of the New Testament. He believed that CHRISTIANS who sinned by divorcing and remarrying didn’t have to go through another divorce in order to UNDO the sin… He came to believe what I have always believed, that the blood of Christ cleanses from this and all sin. Non Christians need to repent and be immersed (born again) and commit to be faithful for life. (i.e STOP DIVORCING). Christians need to repent, confess and pray that God would forgive. Dad NEVER down-played the sin of divorce at all. He knew It hurts, and that God hates it. He understood GRACE, and taught against the abuse of it (Romans 6:1-2). Christians indeed and unfortunately do at times abuse grace. The Christian that repents of this however, can be and is forgiven. The point of all this is simply this… I ONLY KNOW WHAT DAD SAID TO ME. I CANNOT FIND A COPY OF HIS (THREE OR FOUR PAGE) WRITTEN NOTES ON THIS SUBJECT. WITH THIS IN MIND, I AM ASKING THAT ANYONE WHO MAY HAVE A COPY OF DAD’S NOTES AND THOUGHTS ON “DIVORCE AND REMARRIAGE” TO MAKE A COPY FOR ME AND SEND IT TO ME SO I CAN PUT THIS ON THE WEB SITE. This will be very helpful not only to me, but to all who know the pain, shame and guilt that comes from this sin, and want to continue serving the Lord. This material can benefit our evangelism, by presenting the Gospel with grace and love as in truth. This materials can help many leaders in the church who struggle with ‘what to do’ when faced with this situation in their congregations. 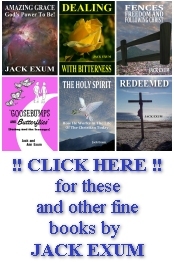 This material can help Christians who have suffered through this, realize their sins, and have repented, and want to serve the Lord further without being shunned or considered ‘second class Christians’. Please help in this search for dad’s material on this subject if you have a copy. He was the boy that would not quit! For that crippled boy, who never did quit.